For the English footballer, see Joseph Sewell. For the US politician, see Joseph Sewall. Joseph Wheeler Sewell (October 9, 1898 – March 6, 1990) was a Major League Baseball infielder for the Cleveland Indians and New York Yankees. He was elected to the Baseball Hall of Fame in 1977. Sewell holds the record for the lowest strikeout rate in major league history, striking out on average only once every 63 at-bats, and the most consecutive games without a strikeout, at 115. Born in Titus, Alabama, Sewell lettered in college football at the University of Alabama in 1917, 1918, and 1919. He led the school baseball team to four conference titles before joining the minor league New Orleans Pelicans in 1920, where he played a partial season before being called up to the "big league". Sewell made his major league debut mid-season in 1920 with the World Series champion Cleveland Indians shortly after shortstop Ray Chapman was killed by a pitch from the Yankees’ Carl Mays in August and became the team's full-time shortstop the following year. An emerging star, Sewell batted .318 with 101 runs, 93 RBI and a .412 on-base percentage in 1921. Sewell's patience and daily work ethic became his hallmarks over the following decade and a half. Playing with Cleveland until 1930 and the New York Yankees from 1931 to 1933, Sewell batted .312 with 1,141 runs, 1,055 RBI, 49 home runs and a .391 on-base percentage. He regularly scored 90 or more runs a season and twice topped the 100 RBI plateau. He hit a career high 11 home runs in 1932. 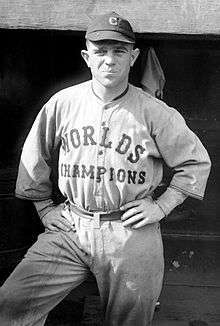 Of more historical significance, Sewell struck out a mere 114 times in 7,132 career at-bats for an average of one strikeout every 62.5 at-bats, second only to Willie Keeler (63.1). He also holds the single-season record for fewest strikeouts over a full season, with 3, set in 1932. Sewell also had 3 strikeouts in 1930, albeit in just 353 at-bats (as opposed to 503 in his record-setting year), as well as three other full seasons (1925, 1929, 1933) with 4 strikeouts. He struck out ten or more times in only four seasons, and his highest strikeout total was twenty, during the 1922 season. For his 1925–1933 seasons, Sewell struck out 4, 6, 7, 9, 4, 3, 8, 3, and 4 times. He also holds the record for consecutive games without recording a strikeout, at 115. Sewell also played in 1,103 consecutive games, which to that point was second only to Everett Scott. 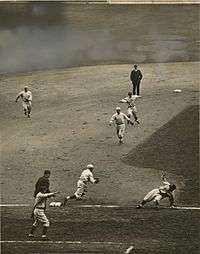 Sewell (bottom right) getting caught in a rundown in the 1920 World Series. His 167.7 at-bats per strikeout in 1932 remains a Major League Single Season record. According to his obituary published in the New York Times, he played his entire Major League career using only one bat (a 40-ouncer he dubbed "Black Betsy. "), which he kept in shape by rubbing with a Coke bottle and seasoning with chewing tobacco. Two of his brothers, Luke Sewell and Tommy Sewell, also played major league baseball.Tommy played in one game with the Chicago Cubs in 1927, and Luke played for four teams over 20 years and, as manager of the St. Louis Browns, led the team to its only pennant in 1944. His cousin Rip Sewell was a major league pitcher credited with inventing the eephus pitch. Joe Sewell was a member of Pi Kappa Phi fraternity. Sewell-Thomas Stadium, the baseball stadium at the University of Alabama, is named in his honor and is nicknamed by Crimson Tide fans as "The Joe". After his retirement, Mr. Sewell worked as a public relations man for a dairy and was a major league scout. In 1964, at the age of 66, he became the Alabama baseball coach, achieving a 114-99 record in seven seasons. One of his pitchers was future NFL standout, Alabama quarterback and 1966 MLB 10th round draftee (Yankees) Ken "The Snake" Stabler. Posthumously, Joe Sewell's community (Elmore County) has established a scholarship award recognizing local high school seniors who exhibit Christian character, leadership in their community, strong academic standing, and athletic achievements. Joe Sewell graduated from Wetumpka High School in 1916. 1 2 3 "Joe Sewell". National Baseball Hall of Fame and Museum. Retrieved 23 November 2015. 1 2 3 4 5 Thomas Jr., Robert McG. "Joe Sewell, 91, Hall of Fame Star Who Set Fewest-Strikeouts Mark". New York Times – obituary. Retrieved 23 November 2015. 1 2 "Joe Sewell". Baseball Reference. Retrieved 23 November 2015. 1 2 Johnson, Bill. "Joe Sewell – Bio". Society for American Baseball Research. Retrieved 23 November 2015. ↑ Rosenthal, Gregg. "Former Raiders quarterback Ken Stabler dies". NFL -official site. Retrieved 23 November 2015. Wikimedia Commons has media related to Joe Sewell. Pound sign (#) denotes interim head coaches.